The secrets of digital marketing and your dental website | Optio Publishing Inc. Your website is the hub of all your marketing. All your digital marketing activities from AdWords to Search Engine Optimization bring traffic to your website. So if you don’t have a good website, all your digital marketing efforts will be wasted... Make sure your website is set up to convert a new visitor to the site into a new patient at your office. It can be hard to evaluate a good website. But just looking pretty doesn’t cut it – lots of factors create a good website to help you gain new patients. 1. User Experience: Can visitors find what they need? Your website might look slick, but if a potential patient can’t find which services you offer, it’s not very useful. To gain insight on your current site, when a patient who found you online comes in to the office, ask them about their experience with the website, how they found it and if they found everything they were looking for. Often, patients provide useful information about your design that you can’t find anywhere else. 2. Visitor Flow: What do you want visitors to do when they visit your site? Do you have a clear call to action and clear navigation of content? Help visitors navigate with an easy-to-use menu and by providing internal links to similar content or having a call to action (CTA). A good CTA encourages visitors to take the next step. Try using “Learn more,” “Book an appointment” or “Call us now” buttons. See if these efforts are working by analyzing the visitor flow in Google Analytics. 3. Mobile version or responsive design: Many people use their cell phones as mini computers. It’s never fun trying to look up information... only to have zoom in and out to read anything on the webpage! A dedicated mobile version or – ideally – a responsive website automatically adjusts to different screen sizes and meets everyone’s needs. In addition, with a responsive design you only have to update your website in one location – whereas a mobile version is an independent website and which needs to be updated separately. Find out more about responsive design and mobile versions of your website. 4. Accessibility: Good website design is accessible for everybody, including people with disabilities. Those with sight limitations shouldn’t have to struggle to read the website text because there isn’t enough contrast between the text and the background images. People with visual impairments often use a reader that reads the content and the images on the website. On an accessible site, pictures have alt-tags or descriptions that describe what the picture represents, and text is displayed from the code and not hidden in images or animation. Make sure your important text isn’t part of an image file – we see this issue when the practice name is only included logo. This mean the search engines won’t be able to read the practice name because it is hidden in the image file. So you need to make sure that any important text is rendered as text and not as an image. Structure your content to target your keywords. If you want Google to show your site for the various services you provide, than you need to make sure you make it clear to Google you provide those services. Creating a page for each service with good quality original content can help you get your websites on the front page for those particular keywords. Find more information on keywords. Write copy for the audience not the search engines - Using natural language and proper grammar, and most importantly don’t over-optimize your text for keywords. Headers (H1) and title tags can also help to reinforce the theme of your website to make sure they’re filled out using your keywords. How do you set up a patient-focused website? Provide value – All your content should provide value to the user. Think about what information your patients need so that they can interact with you and your services. How can you use your website to educate your patients, engage with them, or introduce them to your dental practice? Think about what your patients need – Both potential patient and current patient need various information when they engage with your dental practice. Potential patients might be looking for a dentist near their home, or a dentist who provides a specific service or uses a new technology. Address all of their concerns with content that is easy to find and substantial enough to answer their questions. Current patients might look for a phone number on your website so they can confirm their appointment or they might want to know more about the root canal they have scheduled for next week. By providing contact and procedural information, you can meet your current patients’ needs. Make it easy for patients to contact you – it’s a good idea to have your phone number featured in a prominent position on your website, to have your address and phone number on every page of the site, and to have an interactive map that gives patients driving directions. You can also invite questions or appointment requests using email or contact forms right on your website. 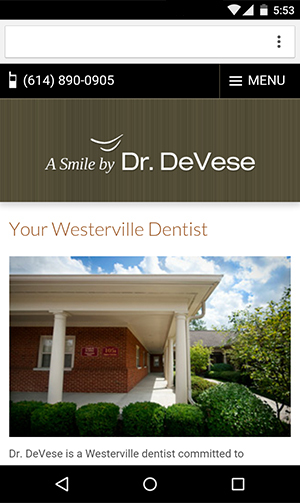 More questions about creating a great dental website? We’re always here to help.